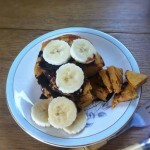 These pancakes first came about last year, I was still on Slimming World and I had started to cut grains out of my diet to alleviate my various stomach woes. 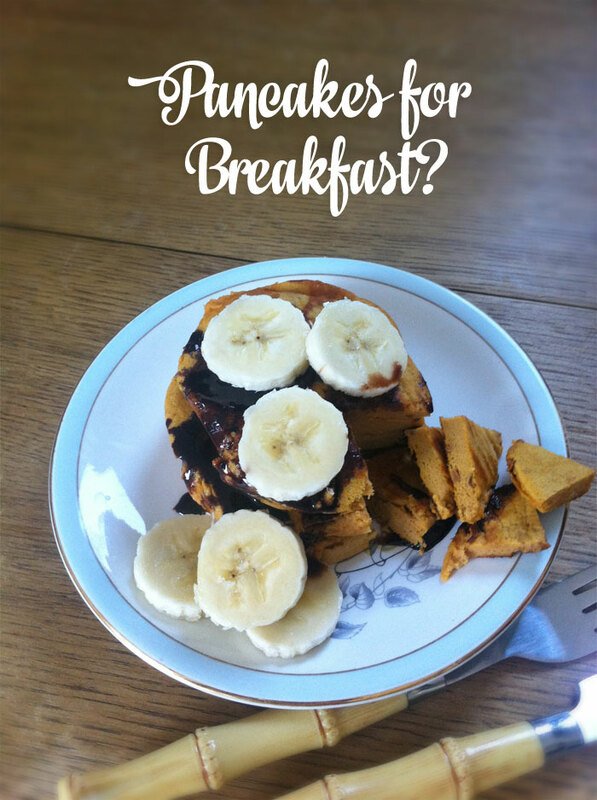 Like any sane person I love pancakes and I love American style breakfasts (possibly more than a good old full English Breakfast, controversial I know!) 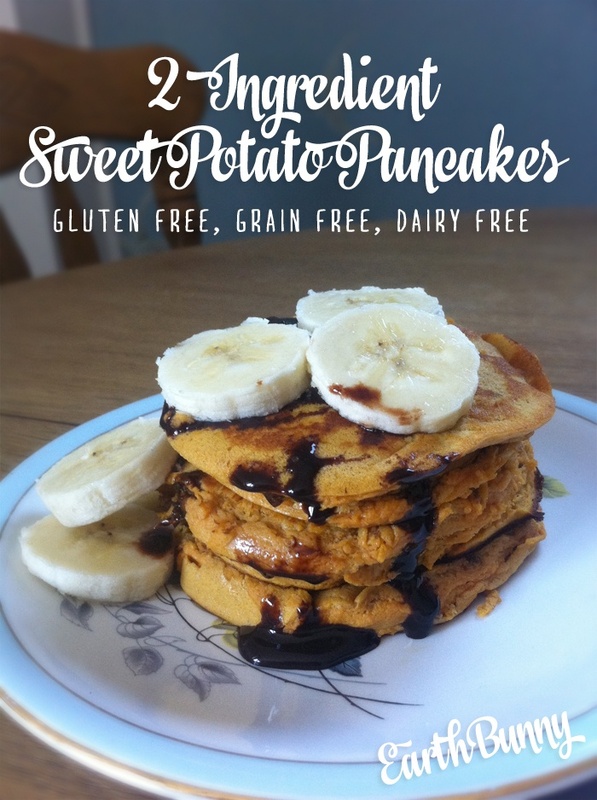 So I was experimenting to create a ‘syn free’, grain, and gluten free pancake recipe and after a bit of trail and error I came up with these little beauts! They’re a lot like American pancakes, ‘hot cakes’ or English ‘drop scones’. 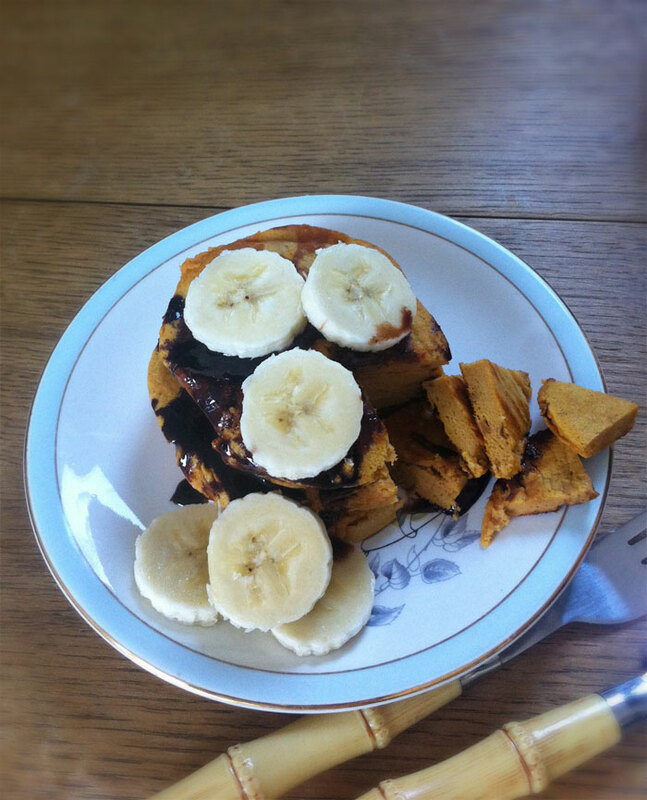 Thick, slightly stodgy pancakes, as opposed to thin crepes, perfect comfort food. Quick and easy to make and they keep for about 3 days in the fridge so it’s easy to make a big batch that will get you through the first half of the week. Stab your sweet potato with a knife several times (with plenty of glee and malice and maniacal laughter) and then microwave on full for 5 mins, or until it’s very well cooked and soft and squishy. Or cut it up and boil it until very soft. Leave the skin on the sweet potato for extra fibre, or peel it if you don’t like the skins. 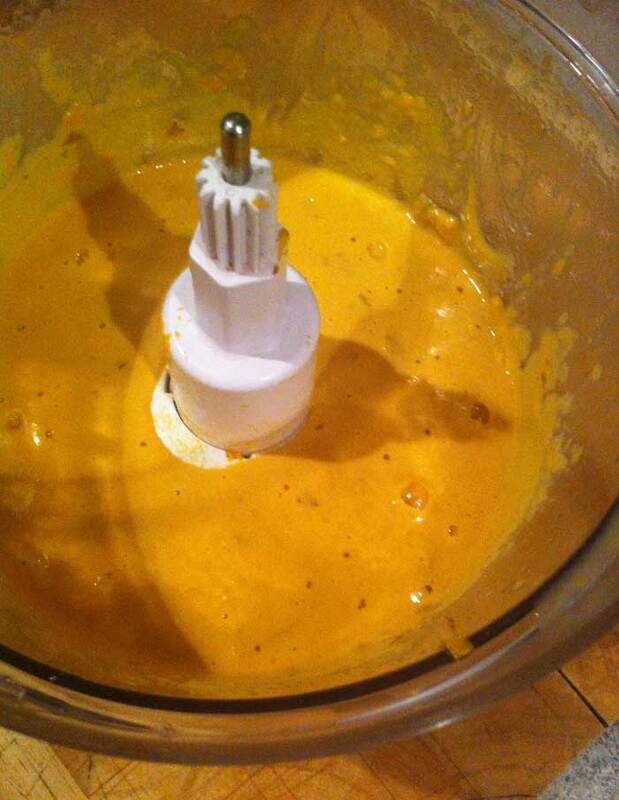 Crack your eggs straight into your food processor or blender. 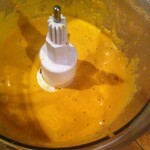 Add your cooked Sweet Potato and whizz it all up until it’s smooth! 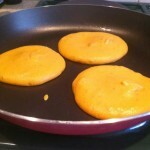 Your pancake batter should be about the consistency of cake batter when finished. 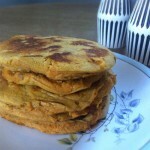 (It will vary depending on the size of your Sweet Potato, if its reeeally thick and not pourable, add another egg!). If you left the skin on you will have some small pieces of skin in the mix but these just adds a bit of texture! 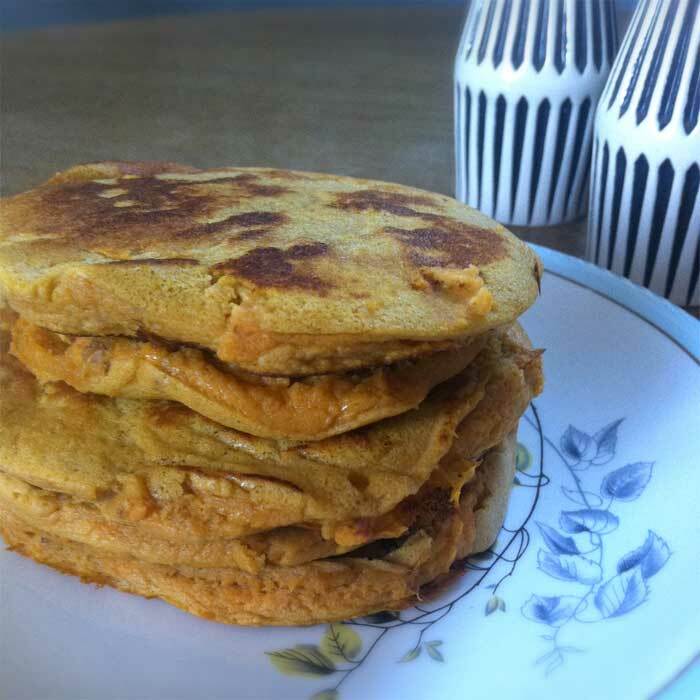 If you don’t have a food processor or blender, mash the cooked sweet potato flesh thoroughly with a potato masher (leave out the skin) and mix it together with the eggs in a mixing bowl (with a whisk if you have one!). To cook, heat a frying pan with butter, oil or cooking spray (or nothing if you have a good non-stick pan) and spoon little pools of pancake batter onto the pan….or just cover the whole of the pan with batter and make one huuuge pancake. Cook until the side touching the pan is golden brown, then flip the pancakes with a spatula and cook the other side! Voila! 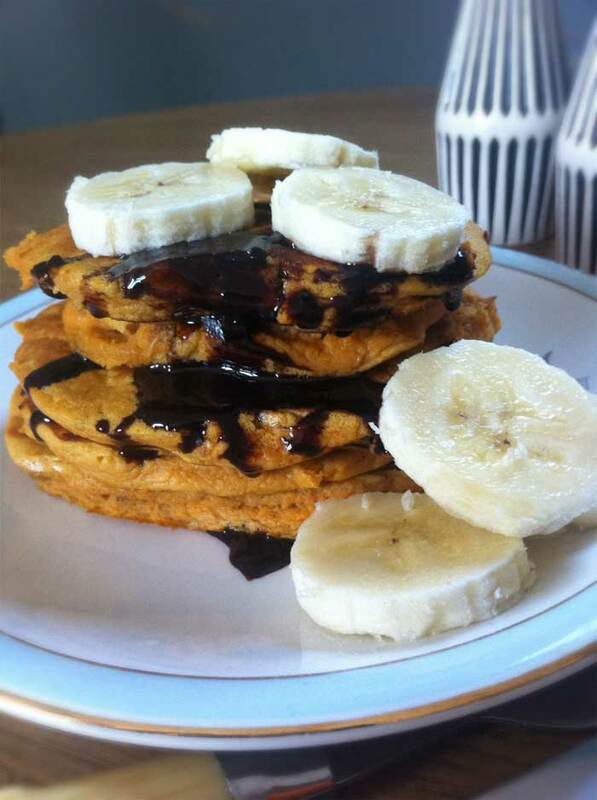 Pancakes in your belly! 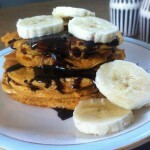 Dairy free chocolate syrup (as shown) – Just 1 tbsp honey, or agave or maple syrup & 1 tbsp cocoa powder melted together! Greek yoghurt & blueberries…or any berries! 3 days in the fridge. I have tested freezing both the cooked pancakes and the batter with good results. Once you have defrosted the cooked pancakes, put them in a hot frying pan again to warm and crisp up, otherwise they’re a bit flabby. Have fun experimenting with all the infinite combinations and let me know if you try anything new! ← An Earth Bunny experiment – does Acupuncture improve your health?